Hyderabad (Agenzia Fides) - The Christian faithful in Pakistan take the opportunity of Christmas to share the feelings of joy and peace with the Muslim communities. 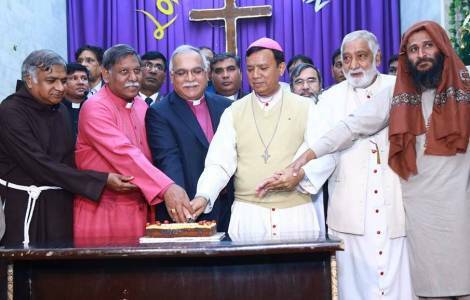 "The Church in Pakistan is fully committed to promoting social and interreligious harmony", explains to Agenzia Fides Bishop Samson Shukardin, who is at the head of the Catholic diocese of Hyderabad. The National Commission for Interreligious Dialogue and Ecumenism (NCIDE) of Catholic Bishops organized a sports festival on the occasion of Christmas and adolescents belonging to various religious communities actively participated. Archbishop Sebastian Francis Shaw of Lahore urged: "Let us take care of each other and let us always work to remain united". The Commission organized, in collaboration with some Islamic leaders, a meeting for students of Catholic and Islamic schools to promote harmony and unity among children of different religions.